Andrei Tarkovsky’s Solaris (1972) was criticized by the powers that be at MosFilm that the film’s opening sequence on Earth was not science fiction enough. In fact these scenes are not even in Lem’s novel from which the film is based. I will argue the evidence presented in the film that the opening sequence on Earth is more science fiction than we think. I will also discuss the incredible mise-en-scene used throughout the film in conjunction with framing, camera movements and how these elements inter-tie with Tarkovsky’s theory on montage. One of the first props that we see on Earth at the dacha that will re-occur at the Solaris space station is the floating balloon above the pond. This balloon will re-appear at the space station in the corridor near Sartorius’ laboratory. To me this is the first sign that the beginning scenes on Earth are not really Earth. The whole film is taking place on Solaris, as can be interpreted by the end shot of the dacha surrounded by the Solaris ocean. The Solaris ocean is a living thinking matter that reaches into the depths of the characters’ memory and re-creates the characters most re-pressed thoughts. The ocean is conducting experiments on the humans that are in turn conducting their own experiments on it. A sequence that seem s quite odd in logical terms is when Chris’ father is talking with Burton. They are both looking out the window, then Chris’ father walks out of frame left; two seconds later he is already outside walking in front of the window in front of Burton at the same speed as when he left the frame. There were no cuts, this is all one shot. To emphasize the impossibility of him getting there that fast Burton then walks to frame left as if to go outside as well and we see the somewhat long wall that he walks by until he gets to the door where Chris’ father is. This to me is a clue that they are on Solaris. There is no indication or sound that he decided to run outside quickly. How can he disappear and re-appear? It is not possible… unless they are on Solaris. 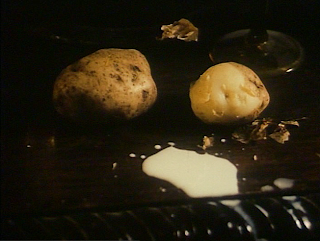 I will later give another example of this disappearing act that Tarkovsky likes to use in his films. This device is always combined within a long take. There are a few characters on Earth that are never identified who they are. Anna, who we later know is not Chris’ mother, but is maybe his father’s new wife? Or is she a Solaris sent illusion for the father to live with, similar to what Hari is for Chris? When Chris arrives back on what we first think is Earth, he is walking towards the dacha and we notice the fire he set before leaving for space still burning with papers scattered around it. This clue tells us that time might pass by differently on the space station, than on Earth, or that he was never on Earth. This might be another scene that Chris has been inserted into by the ocean. He has made peace with Hari, now he might have to make peace with his father. As he approaches the house there are more clues that he is still on Solaris. The camera observes him approaching the dacha from inside the house. Here on the window ledge is the metal box that he had left on the ledge of the portal on the space station. Why is it here now? It is also raining inside the house, like in Chris’ room on the space station after the scene where Hari and Chris were looking in the mirror. When Chris’ father notices him we have a real eyeline match between two of the film’s character’s. However, the window separates this connection. Chris is outside and the father is inside with the rain. The opposite of what we saw at the beginning of the film where Chris was outside in the rain and the father inside. Tarkovsky is showing us that although their issues are not resolved, it means that there is hope that they can be. This is reinforced with the last image of Chris kneeling down in front of his father; similar to the way he was kneeling in front of Hari in the library. Characters in Solar is often never looked at one another while speaking. One of the first examples in the film is when Burton and Chris are discussing Solaris. This back-to-back conversation occurs frequently throughout the film and is a device used to show man’s inability to communicate with eachother. What is interesting in this sequence is Chris standing against a tree house painted in a light blue. This color often comes back in the film representing hostility. Later when Chris arr ives on Solaris and visit’s Snaut for the first time we see a glimpse of Snaut’s visitor in a blue hammock. This scene is filled with hostility as we first see Snaut bandaging his hand (as he is often doing in the film) presumably from an injury incurred by his visitor. When Chris approaches the blue hammock Snaut tries to get him away from discovering it. Snaut’s room is also representational of his state of mind. It is highly unorganized and messy. He is a tortured soul at this point in the film and his surrounding supports this. Chris at this point in the film has a level head, sure of himself and the mission he is on. The room that he picks is a copasetic and clean; white is the p re-dominant color. At the very center of the frame is the portal to look out onto the ocean. It is nighttime so the portal is shown as black. What is interesting is that Chris is also in black. One cannot help but draw a parallel between the two. Does the ocean already know that Chris is there? Has it already started reading his mind? His room will gradually become messy and disorganized like Snaut’s as the film progresses matching his state of mind. The room also has a circular theme. The room is a circle, the table, the portal; even something that is square like the bed has a circled feature to it. The little cubes on the wall makes us think of the square electronic devices that filled the wall in Snaut’s room, drawing a connection between the two. The color blue comes up again as Chris meets Dr. Satorius for the first time. When the scientist comes out of his laboratory after Chris threatens to break down the door they begin to talk but they hardly make eye contact with one another. The glass door to his laboratory is covered by a blue blanket to hide its contents. Satorius seems ashamed of the visitor Solaris had sent him. It is the same color that is used to hide Snaut’s visitor. Hari’s introduction is a highly stylized sequence. The shot before we first see her live (and not in a picture) Chris is ly ing down in an unmade made covered in plastic. The shot is in black and white; perhaps an indication that it is night. The camera slowly tracks over his body to end in a medium close up of his face. During this, the sound of the Solaris ocean is slowly intensifying, suggesting that it is delving into Chris’ subconscious, looking for a memory to reincarnate. We cut from Chris’ face to an extreme close up of Hari’s face. The camera then tracks out of this extreme close up to reveal Hari sitting watching Chris sleeping. This track out is the opposite of the previous track in shot onto Chris. As she walks by the portal we notice that it is white, suggesting to us that the ocean’s intentions are good ones, not evil. It also gives her an angelic glow, as if telling us that she is Chris’ angel or savior. If the portal were to still be black one might think that the ocean’s intentions were not pure. The mise-en-scene is quite unique when Hari is looking at herself in the mirror for the first time. We have three Hari’s represente d, foreshadowing the three Hari’s that will appear in the film: The one presently looking in the mirror, the one that comes after Chris sends the first one off in the rocket, and the resurrected Hari that comes back after killing herself. We immediately know that she is an out of this world visitor. How did she get in the room when Chris barricaded the door to his room with large metal chests? She is also wearing exactly what she is wearing in the photo she finds of herself, playing on the fact that she is created from that memory. The second Hari again comes while Chris is sleeping. The camera movement’s almost identical to the first time Hari comes. It slowly tracks over his body, ind icating a repeat of history, like a mirror. This time the image of Chris is not in black and white it is in an orange sepia tone; similar to the tint or lighting that was shining on Hari extreme close up when she was first introduced. This time we have the sound of wind that sounds like a burning fire. This color tint and sound gives us the impression that Chris is in his own personal hell. The mise-en-scene when Chris wakes in a room of mirrors from being sick is an odd combination of the space station and the dacha. The items from the dacha are covered in plastic. We have the mannequin with the cowboy hat on, and the window from the dacha seen at the beginning of the film i s now the window of the space station with vases filled with water and plant life coming from them. At this scene’s opening the camera turns around the room in a long take revealing many Hari’s, his mother and his childhood dog. We see the mother still uninterested in Chris’ life and is more pre-occupied with setting the clock to the right time than speaking with her son. She does however perform a loving motherly duty when she sees Chris arm either injured or dirty. She washes it in a basin similar to the basin in The Mirror when the mother is washing her hair. The cleaning of Chris arm draws a parallel to when Chris cleans Hari’s arm after her injury of breaking through a metal door. 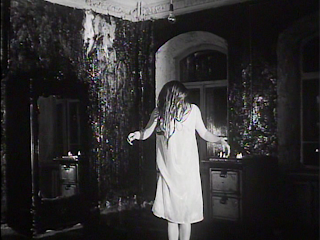 The indifferent mother is a familiar theme in Tarkovsky’s work and we see it particularly in The Mirror. The mother at one point walks many miles with her son to go see the doctor’s wife to get an abortion. This mother not wanting another child is represented in two beautifully symbolic shots with the son outside. The first is him subjective POV staring at spilled milk on the table dripping on the floo r. Milk is a symbol of motherhood, so it being discarded on the floor is a sign of rejected motherhood. Then the light in the room flickers on and off here symbolizing the loss of life that is taking place in the adjacent room. Perhaps Tarkovsky felt some resentment towards his mother for her treatment towards him? The film’s opening shots can be sees as Tarkovsky’s adoration of his mother, I believe the film’s opening is a cry for his father’s love. The narrator says “If he turns towards the house its father. If not, it isn’t him” possibly suggesting that the narrator is the child playing a little game with himself as he sees a man approaching in the distance. He is hopeful that it is his father. It is plainly obvious that he deeply misses him. What is odd in this sequence however is that we don’t see the child until the mother looks back at him sleeping in the hammock. 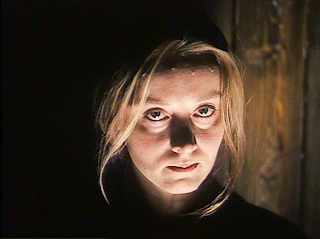 Vlada Petric In Tarkovsky’s Dream Logic describes the opening shot of the field as a point of view from the female protagonist. I would say the opening shot can be described as a displaced subjective point of view shot from the child’s POV; further justified because of the narrator’s voice over. 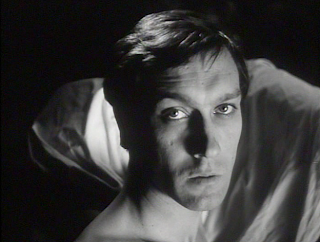 Later after the burning barn we see a young Ta rkovsky at first awake in bed. He is looking out the window at the forest beside the house. At first it is still, then the camera tracks left and then the wind starts to blow through the trees. It cuts back to the child now in black and white and the sound of the wind carries over into this shot. The wind represents the boy’s father. The child whisper’s “papa.” The boy then gets up to see his father pouring water on his mother’s head as if baptizing her. She then gets up in a monster like way keeping her hair in front of her face. 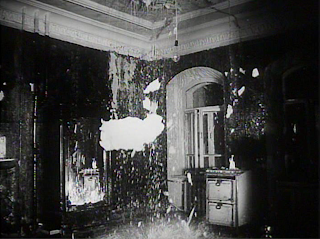 The camera tracks out to include more of the room, with walls covered in mildew and a little fire on the stove. Then in an almost invisible cut the ceiling starts falling down where his mother was standing. Is this the boy wishing his mother dead in his dream? The next cut shows her walking towards the left with water and plaster falling all around her. The camera continues to track left as she stops and we see her reflection in the mirror. The camera continues tracking left still on a piece of dark wall with water dripping along it. The track shot stops when all of a sudden the mother is no longer beside the mirror she is magically in another part of the room. The camera pans to a mirror where we now have the mother’s reflection but as an older woman. You can feel that Tarkovsky was sympathetic to his mother’s problems. Her husband was never home and this seemed to deeply depress her. After the abortion sequence she beheads a hen (a male chicken) and is looking directly at the camera. The camera then cuts to a shot of her husband in an eyeline match. But what is odd is that this eyeline match is impossible because they are not in the same room and not even in the same time (indicated by one shot being in color the other in black and white) but the intensity of her stare you can feel that she is looking right at him, wherever he is. In Nostalghia our main character at the end of the film tries to walk across a pool of water with a lit candle. Every time the candle burns out he goes back to his starting point to re-lights it and start his journey again. The camera here does not cut, it follows his slow actions with a slow track into his face for a final close up as he reaches his destination without the candle burning out and dies. Why keep this as one shot? It is a “meditative, perhaps hallucinatory, swell of mobile imagery”4 Tarkovsky wants the viewer’s eyes to roam the screen and discover the minor details in the mise-en-scene without having to cut to it. For example in Solaris while Tarkovsky is panning around the room in which Chris encounters Snaut for a second time we notice a butterfly collection hanging on the wall. This is the same butterfly collection in Chris’ father’s dacha. At the end of this same long take lasting over two and a half minutes we have the famous character disappearing and reappearing act as described like so: The camera is panning and tracking around the room in a circular motion, following Chris and Snaut as they talk about things the strange happenings on the space station. 1. The camera is still as Snaut and Chris talk about sanity. 2. Snaut walks away towards the left and the camera follows him. Snaut stops. 3. The camera continues to pan over objects in Snaut’s room, Chris in the viewers mind is to the screen right; right behind Snaut which we just panned over. 4. Behold! Chris is now beside this vase as the camera continues to sweep over the room. How did he magically appear there? How is this humanly possible unless he ran, but there is no idication that he did so. 5. Chris walks towards screen left to exit Snaut’s room and passes by Snaut who we thought was to Chris’ right, but he is now to his left. The theory of picnolepsy can be applied to the character’s state of minds and Tarkovsky’s method of using a long take with disappearing / re-appearing characters in Solaris. The previous scene discussed is an example. Virilio says that time comes together with no breaks; a break in filmic terms can be a cut. This scene is all one take with no cuts. The glitch in consciousness lasting a few seconds happens here as well as we see in the fourth photo. When the camera pans on him he is staring blankly into space as if unaware of where he is and why. He then quickly snaps out of it as if nothing happened and continues the conversation with Snaut. Picnolepsy to me is a perfect diagnosis for the outlandish behavior we see on Solaris. After the library scene Chris realizes that Hari is now alone in the library. Remembering the previous time she was left alone he rushes back to her. When he arrives back at the library she has her back to him (she is also smoking!) She is caught up in the winter scene painting on the library wall. In a scene similar to the prologue of Andrei Rublev, the camera pans along selected parts of a winter scene painting, eerily similar to the short film Chris showed Hari earlier. Perhaps this is why Hari is so enthralled looking at it. Perhaps this scene is some sort of nostalgia for the earth. Tarkovsky contradicts his theory of the long take in this sequence as he cuts on many occasions, telling the viewer what to look at in the painting instead of us roaming it with our eyes at our free will, like one of his long nature shots. Tarkovsky does get into some rhythmic montage in Solaris. “Matching shots of differing rhythms can be done without destroying this organic process if it grows out of an inner necessity...” An example of this is the highway scene with Burton in the car with his son. “ …Through camera movement, sound and consistent forward direction the shots in this sequence share the same rhythm. The montage heightens to a frenzied single-frame fusion of overlapping highways, lights, skyscrapers and cars.” What follows is a cut of the pond beside the dacha; quiet and placid. “The time pressure in this shot is opposite from that in the previous shot”7 These two shots following eachother is a symbol to one of the film’s themes of man versus nature and old versus new. Tarkovsky says that he “rejects the principles of montage cinema because they do not allow the film to continue beyond they edges of the screen: they do not allow the audience to bring personal experience to bear what is in front of them.” I would tend to disagree with this statement. Eisenstein by putting together two shots to create a symbolic third to me is something that is happening beyond the edges of the frame. 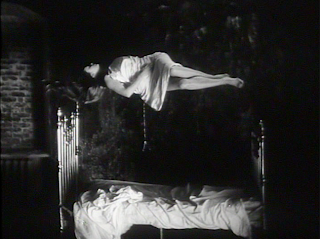 This third image is created in the mind of the viewer; the audience is psychologically taking part in editing the film’s meaning. So to say that “Eisenstein prevents the audience from letting their feelings be influenced by their own reaction to what they see”8 and “an inexact rhythm in film destroys the veracity of the work”9 is false. The issue of immortality / mortality comes up a few times in Solaris as well. The first instance is when Burton is watching his younger self on the film. Later in the film Chris and Hari watch an old film on the space station. Chris gets to see his younger self, his de ad mother, and Hari gets a small glimpse of her past. They are all looking into the mirror of the past. Ironically what immediately follows this scene is Chris and Hari looking into a mirror. Here they question who they really are. At first there is a duality created by the characters, plus their reflections in the mirror, but then the camera zooms in to only their reflections. Hari’s is distorted by specs of water on the mirror showing us that she still does not completely know who she is. At the end of the library scene there is a moment of weightlessness, where we see Chris and Hari lovingly in each other’s arms floating around the library. This could mean that Chris has resolved his inner issue and feelings for Hari and that his spirit is re-born. Solaris is a film that asks many questions and does not give any answers. Here I have skipped a stone on the ocean of what the film Solaris actually is and have touched on his other filmic themes that are equally in Solaris as his other features. Jean Renoir said that “a director makes only one movie in his life. Then he breaks it into pieces and makes it again.” This might not be true for all directors but for Tarkovsky it certainly is. Fugue (Bloomington & Indianapolis: Indiana University Press, 1994. Tarkovsky, Andrei. Sculpting in Time. Translated by Kitty Hunter-Blair. London: The Bodley Head, 1986. Atwell, Lee “Solaris: A Soviet Science-Fiction Masterpiece.” In The Film Journal 6. Cahiers du Cinema no. 386 “Le Cinéma de Tarkovski.” 12-26. Hoberman, Jim. “Tarkovsky Arrives.” Vulgar Modernism. 1991, 89-100. Montagu, Ivor, “Man and Experience: Tarkovsky’s World.” Sight & Sound. Fiction Studies 14 (1987): 294-305. Journal of Film Studies. 2.1 (1992): pp. 21-30.
by V.T. Johnson & G. Petrie, Canadian Journal Of Film Studies 4/2 (Fall 1995): 51-59. Wright, Alan, “A Wrinkle in Time: The Child, Memory, and The Mirror.” Wide Angle 18/1, 47-67.